Some features completely change the way you do something! This new option to create a loop by sending an email is one such feature. It is pretty simple and here is how it works. 2. 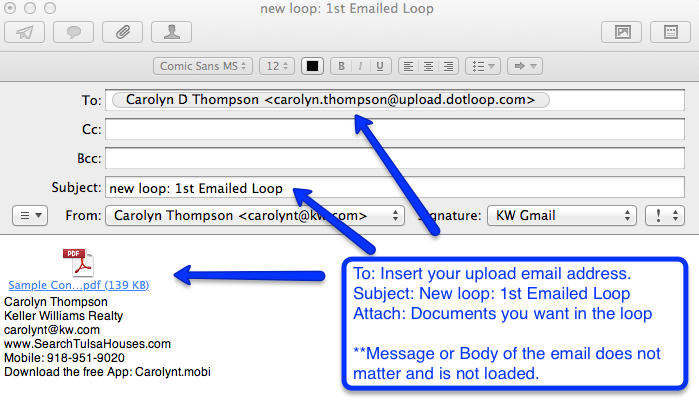 In this email, attach the documents you want to load into the loop and in the subject line type this: “new loop:”. The colon is required. If you do not add anything after the colon it will name it “This is your new loop”. If you do add something after the “:” then that will be the name of the loop. For example: “new loop: 1st Emailed Loop”, then your loop will be named exactly that, see the example below. This does not submit it to the office for you, but it does create the loop for you. This is a great option for agents that just want to turn in documents but not use all of the options of dotloop. The second new feature to emailing into your dotloop account is that you can now add documents to a specific loop just by sending an email. The email address to send it to can be found inside your loop under the “add documents” and it is the 3rd option on the right. Please note: If you change the loop name, the “email files in” address will also change. It’s time for you to try! Go create your own 1st Emailed Loop! One of the more recent updates in myTransactions/DotLoop are the option for “Layouts”. I’m sure you are wondering where and what is she talking about. If you have no idea what a “loop” or DotLoop is, watch this video: This article is more for those of you that have already created a loop and are using the system, or at least a little familiar with it. Ok, so when you have a loop created, you have the option to add live documents or PDF’s. When you load a PDF into the DotLoop system it doesn’t know what the form is, just that it is a PDF. After you have loaded the document you have the option to “edit” the form. You will see the standard options for layering on the features of: Signatures, Initials, Text or Checkboxes. The new option is the “Layout” button in the middle of the menu bar at the top of the document. The “Layouts” are added by your brokerage (in a later version the agent will be able to create Layouts). Select one that applies to your form and the fields you need will appear. For example, if you have a property disclosure for an offer you are about to write where a seller has already completed it and now you need to send it to the buyer. With a template created in the system for a standard disclosure for buyer’s signatures, you will click on the “layout” button and select the appropriate layout and apply. Once added you may have to adjust the boxes slightly if the scan is not exactly in the same place as the original, but it will at least put it close to where you need it. This is a great time saving idea. You might need to ask your office to create layouts for different forms. This option applies to not just 1 page forms, but with multiple pages. To help your staff, you might want to send an example form that you need a layout for. In case you are wondering the reason they started this at the broker level is so the main layouts that multiple agents will use can be added at a broker level and subsequently reduce the number of individual duplicate layouts. It makes since to not bog down the system and when the agent level is released everyone will be able to create their own layouts.